Matthew Kainoa Wong was born and raised in Waiohuli, Maui on a cattle ranch that is run by his ʻohana. 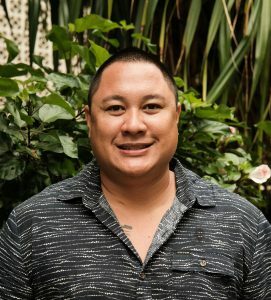 He attained his Bachelor’s degree in Hawaiian Language, his Post-Baccalaureate Degree in Secondary Education and his Master’s Degree in Hawaiian Language from the University of Hawaiʻi at Mānoa. His Master’s thesis and project focused on Paniolo lifestyle and cattle work. He teaches Hawaiian language levels 101-202 and still returns to Maui to work on the ranch. Established in 2007, Hawai‘inuiākea is Kamakakūokalani Center for Hawaiian Studies, Kawaihuelani Center for Hawaiian Language, Ka Papa Lo‘i O Kānewai Cultural Garden, and Native Hawaiian Student Services. Hawai‘inuiākea is the only indigenous college in a Research I ranked institution. The mission of the Hawai‘inuiākea School of Hawaiian Knowledge is to pursue, perpetuate, research, and revitalize all areas and forms of Hawaiian knowledge.